Closed circuit cooling tower connects circulating bucket. Closed circuit cooling tower connects circulating bucket. Closed circuit cooling tower connects circulating bucket. 2 inlets and 2 outlets. #304 stainless steel material. 5 tons of circulating bucket. Ladder is included. 2 inlets and 2 outlets. #304 stainless steel material. 5 tons of circulating bucket. Ladder is included. We export cooling towers and ambient circulating water bucket. We export cooling towers and ambient circulating water bucket. 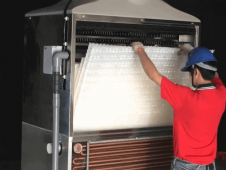 The circulating water tank is in place to act as a cushion and distribute cooling water to different loops. 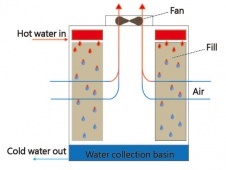 Then utilize single or several circulating pumps to distribute cooling water to equipment. Generally speaking, it is necessary to consider the water consumption of overall system as a base for water tank capacity. Then, think its arrangement and decide the model. 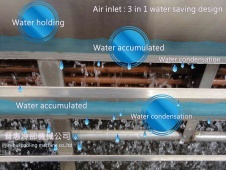 The connection between closed circuit cooling tower and circulating motor is by the medium of circulating water tank. Requirement for multiple loops can be done by opening holes according to the water way. For circulating water tank, customers are able to choose SUS304 stainless steel material or plastic water tank. Most in use are SUS304 stainless steel with the thickness of 0.5mm-1mm. Don’t hesitate to contact us if you have any question regarding layout, material, bore diameter or volume of the circulating water tank.